“I found myself in Afghanistan.” I said these words to my soul sister, Christiane, yesterday upon returning from Kabul a few days earlier. “Does that sound corny?” Inwardly cringing at the Pollyanna sound to the first statement. Not that I was lost. But for the first time I felt completely at ease in my own skin. I am someone that is reasonably confident, independent, and basically quite happy with myself and the people around me. I don’t pretend to be something I’m not. I am what I am, and as my friend Tony put it – “you just do what you do.” But there is always that feeling of holding back a part of who I really am for public consumption. Not wanting to be the one on stage (funny for someone who studied to become a professional dancer in an earlier life) or be the center of attention, yet reluctantly finding myself in that position more and more frequently. Feeling that I should ‘tone down’ a little my emotions, desires, goals, and expectations around others to put others at ease. In Kabul, that all changed. I felt at ease, despite distinctly standing out in a crowd. I felt comfortable stepping into uncharted waters of first ever interviews taken with cabinet ministers. Doubt didn’t enter into the decision to jump on a buzkashi horse when the challenge was thrown down, despite being the only female around. I was just doing what I do. Often without thinking, just the natural rhythm of being true to one’s self. Part of that came from that fear of looking Pollyanna-like, by truly admitting that by reading “Three Cups of Tea” and founding Mountain to Mountain that I’ve discovered what I want to be when I grow up. 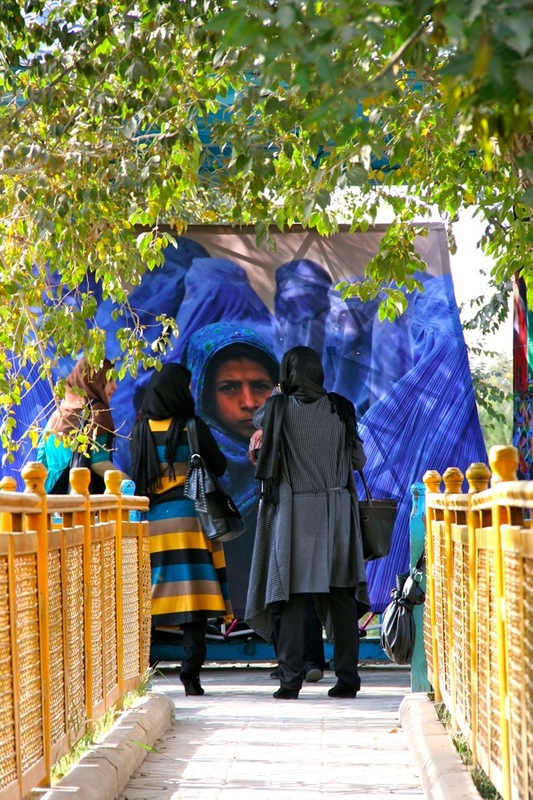 Afghanistan showed me that reality of possibilities being possible. And he is right. 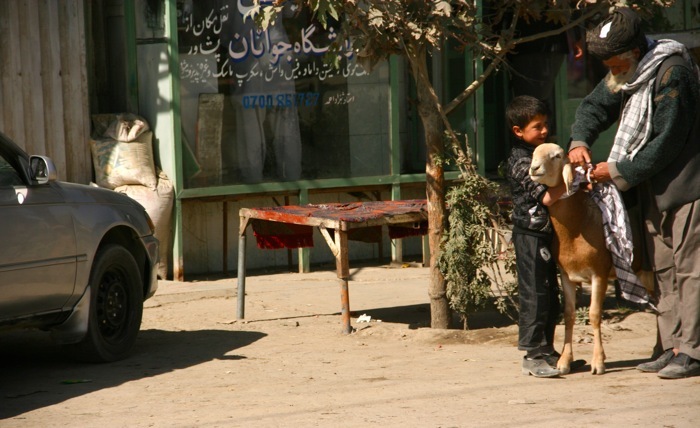 There are no rose colored glasses when I look at Afghanistan, and truly feel at home. There is dirt and dust, squalor and poverty, gender inequality, corruption and crime. Quite the polarity shift from life in my quaint mountain ski town in the Rockies. Yet I see the magical quality in this small corner of the world. 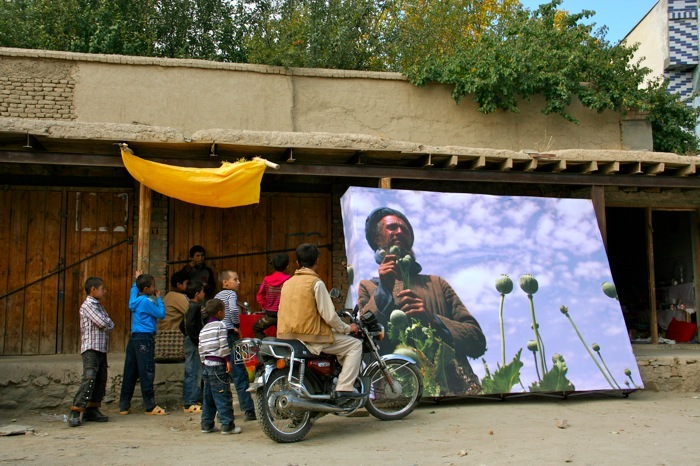 The crossroads of the silk road where diverse cultures and races intertwined. A land that has refused to be tamed by its multiple occupiers despite their best attempts to destroy the land and the culture. A people that refuse to give up and continue to fight for their children’s future and their country’s true potential. So it was here, that I stepped up the plate and accepted that I will try to find my voice through writing (something never attempted before a few months ago). I will try to tell the stories I see in Kabul in hopes of inspiring others to see beyond the war and terrorism, and look instead to the amazing people working to change their own country’s path, the children that need schools, and the artists that thrive to keep Afghanistan’s culture alive. It was also in Kabul that I accepted that I do, in fact, want to ‘save the world’. I want to do my small part and make a difference. I want to find projects, raise money, complete projects, affect lives, and then repeat. I want others to join me and share the burden and the joy. We arrive at Faheem Dashty’s family home, by way of a narrow alleyway off the side of the road surrounded on both sides by steep rock walls. Shah Mohammad confidently steers the car through while Tony reaches out the window and touches the wall. Faheem welcomes us and directs us to the lawn where a table and chairs is set in the garden. Surrounded on both sides by mountains, with the garden overlooking the river – it’s hard to believe this was the stronghold of Massoud’s resistance against the Taliban. Its too peaceful. Soon Faheem’s father comes out to the join us. The General. A larger man, with a kind, grandfatherly face greets us and warmly shakes my hand, welcoming us to his home. We all sit and a servant brings out freshly squeezed apple juice from their own trees. Thick and pulpy, the juice is the first I’ve had in days and it tastes as though I’ve just bitten into a sweet yellow apple. A refreshing break from the constant stream of watery green tea. Faheem and The General shared many stories of the family home, Panjshir valley, life during the Soviet occupation, and their relationship with Massoud. Massoud played a leading role in driving the Russians out of Afghanistan, but is famous for his stronghold in Panjshir keeping the Taliban from moving in from Kabul. The General told stories of how Massoud asked him to blow up the road at the beginning of the valley entrance to keep out the Taliban. The road sunk to the valley floor, level with the river and Taliban where they were either captured, killed, or fled back to Kabul. The ironic thing is that the General’s job with the government was road building. Faheem’s daughter and son played in the garden, his daughter occasionally coming over to make Faheem give the teddy bear a hug, or flirt with the guests, especially the one with the camera! After a couple of hours of chatting, sharing stories, and making pictures, The General guides to a little outbuilding on the other side of the garden for lunch. We enter a tiny foyer with a red afghan rug just large enough to slide out of our shoes and walk into a small rectangular room with cobalt blue pillows lining the four walls. We sit down, cross legged (it is considered rude to show the soles of your feet to others) and a tablecloth is spread in the middle of the empty space. Food and water is brought in from the kitchen and Faheem passes along plates, and platters of food. I sit next to the General and he gestures that I should serve myself first. Reminding myself to only eat with my right hand, I follow his directions not wishing to make a faux pas. Let me just insert how much I adore Afghan food. Truly. It is a great joy to have been invited to a private home and have a homemade meal made in our honor, doubly so given our host’s stature. A platter heaped with rice with raisins and carrots covers tender hunks of lamb. Another platter is stacked with fresh naan bread. A bowl is filled with quorma, a slightly spicy Afghan stew of lamb chunks and potatoes. A tiny condiment bowl of spicy green peppers crushed with garlic, and another bowl of tomatoes, onions, and fresh basil. Lastly, a bowl of yogurt, freshly made that day. Everything from meat to veg to naan bread has been produced on the family land, and then cooked by Faheem’s mother, the General’s wife. I am in heaven as the General keeps gesturing to “eat more, eat more”! Tony jokes with Faheem that his mother’s cooking will be famous tomorrow as I will be sure to write about it. He’s not wrong! After a post-lunch walk around the garden, we say goodbye to the General who insists firmly but with a wide smile that I must return to see him. We walk through the inner courtyard and pile into The General’s Toyota 4×4 and Faheem drives up the valley to visit Massoud’s grave and his home. The car is fairly quiet, despite the brain jarring roads, and as we get closer we can see the construction in progress of the tomb that is to encase Massoud’s grave. Faheem stops to say hello a group of contractors working on the tomb and I press my right hand to my heart and say, “Salaam” to each of them. We follow Faheem and I hang back in respect as he bows his head, while Najibullah and Shah Mohammed pray silently on his other side. The mood is somber as we walk slowly back to the car. On the drive back I ask Faheem if I can ask him some questions about the current situation in Afghanistan and he opens up quite readily. This is his forte and we pick up from a conversation we had the day before in Kabul. He speaks frankly of his analysis of what will bring peace and stability to Afghanistan, as I sit next to him thinking, I’m hearing the thoughts of a great mind, and it makes the trip out of Kabul all the more fulfilling. Today, we spent the day in Panjshir province – yes, I know I said I wasn’t going to leave Kabul, but you all know me too well to realize that that was never going to happen. Security situation on the road was checked the last night and again this morning and it was determined, that yes, we could make the drive. I was keen to make the trip after our meetings yesterday at AINA Photo Agency. The reason being that we were invited by Faheem Dashty, the founder of Kabul Weekly. 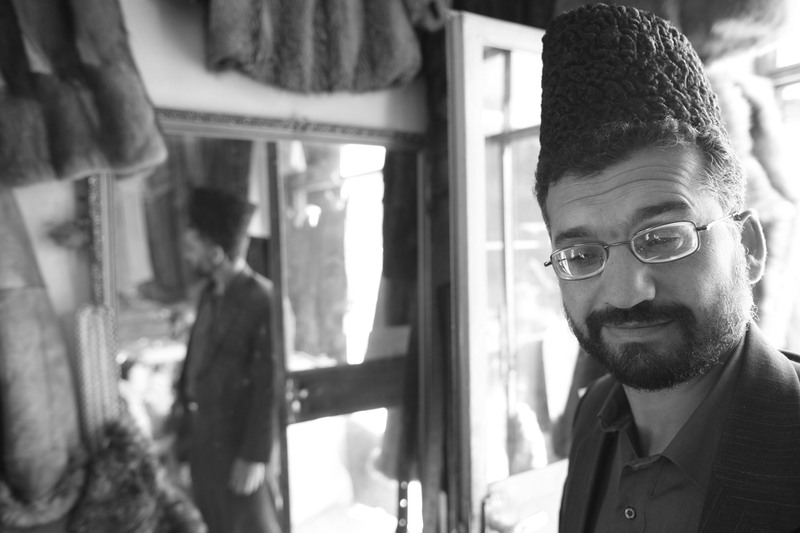 Faheem was with Afghanistan’s beloved resistance leader, Massoud, when he was assassinated just days before 9/11. He himself was gravely injured but he survived and resurrected the Kabul Weekly as Afghanistan’s largest independent newspaper. He has a keen political mind and is passionate about the future of Afghanistan. He and I spoke at length after the meeting at AINA, and warmly invited us to come to visit his family’s home. An offer I couldn’t refuse. We set off at 8am, myself, Tony, Najibullah, Najibullah’s small son Serat, and of course, our faithful and daring driver, Shah Mohammed. 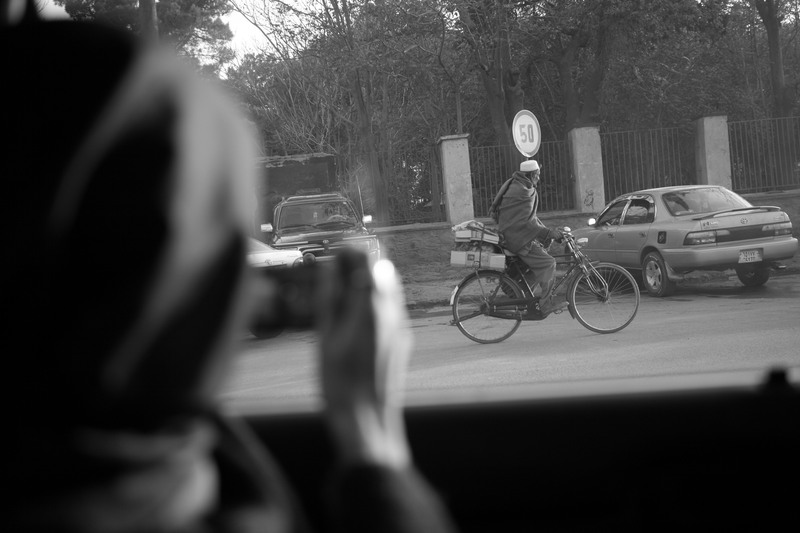 One of the rules we were given for photography in Afghanistan was you are not allowed to shoot women, and try not to be seen photographing in the car. Its okay to photograph in general, but the police will stop you if you are shooting ‘secretively’ and will take your film if they catch you. Tony is pretty adept discreetly from the car, and has got some great shots of women. Unfortunately, we are leaving town, and had just drove around a burqa clad women sitting in the middle of the street with her child (which Tony got a great shot of), when I mentioned that I would love a shot of the road itself (which would require serious 4×4 capabilities in any other country). He quickly obliged and raised his camera right as we passed a policeman who immediately flagged us down. Fearing the worst we handed over our passports and papers, which he quickly handed back and wished us safe travels. Big oops and I vowed not to ask for split second photos again! Leaving Kabul the view opens up to a wide expanse of varying shades of brown. The landscape is devoid of green other than fields of grapes on the right, with mountains to the far left with mud huts and buildings scattered across the foreground. Periodically, markets fill in the gaps and the hustle and bustle of the bluebird colored burqas, bejeweled trucks, and children scampering throughout the traffic add bursts of color to the scene. Najibullah is a constant source of historical tidbits and local information and keeps up a steady stream or running commentary throughout the drive. We reach a checkpoint with a large sign that arches across the road. It is a sign from the Ministry of Health, Najibullah tells me, its refers to family planning and that space between children is good for both the mother and child. In other words, don’t try to knock up your wife a couple days after she gave birth. We see landmine clearing on the left and stop to buy some grapes from one of twenty men selling them all in a line at the side of the road on the right with more grape vines spreading out behind them…hopefully land mine free. 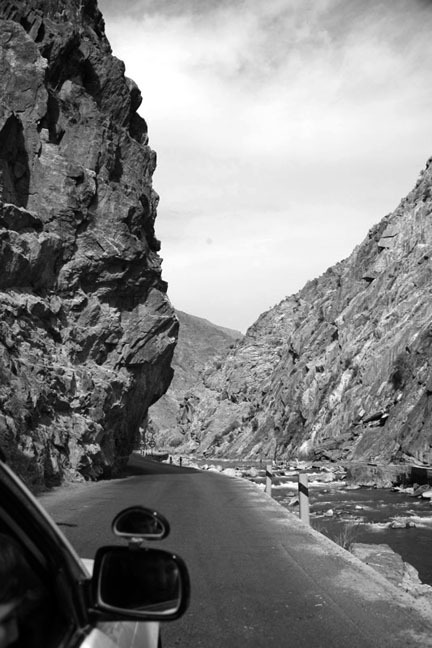 The mountains close in as the valley narrows to follow the river and we come to the entrance to Panjshir valley. The road winds through and we come to a little checkpoint manned by an older fellow who waves us along as we drive by, less of a checkpoint and more of a greeter it seems. Five minutes further along we come to a proper checkpoint and the only one of the entire valley. Manned by many of Massoud’s men, a serious looking bunch who peer in through the driver’s window and ask a few questions. Upon seeing me, I put my right hand on my heart, nod, and say Saleem. He responds in kind and smiles, allowing Tony to take his photo. He was a commander under Massoud and now works this checkpoint. They invite us to join them for tea, but Najibullah explains that we do not have time to stop. I’m a bit disappointed, how often is one invited for a roadside cup of tea by ex-mujahhadin fighters? A little further along, munching, slightly wrinkled, anemic looking grapes out of a pink plastic bag, we come to a village that screams, “You’re not in Kansas anymore”. The road narrows to a one dirt road. Market stalls press in tightly. A cow is getting butchered on the street in front of the butcher shop, can’t ask for fresher than that! We snake our way through the crowds of animals and people and all I can think is what I would give to get out of this damn car. I’m aching to stretch my legs and get closer to this experience. Coca cola stands, fresh fruit, several more butcher shops, and clothing shops all have their wares simply hanging by strings and ropes off the low roofs of the shacks. As we drive further, over a bridge, precariously perched above the river – looking as though it would hardly support a small donkey, much less a carload of five, we see several graves periodically dotting the landscape. Many have green flags blowing in the breeze that mark them as martyrs for the resistance. Slowly the landscape adds some color as trees with golden yellow leaves appear in great clusters along the sides of the mountain across the river. We’ve caught the last few days of autumn in Panjshar before the winter comes in. The colored foliage is a welcome sight and makes me realize how little color we’ve seen. Even in the local park of Shara-nau there is no green in sight. Only dirt and rows of barren trees. a little over two hours later we arrive at Faheem’s family home and the story continues…..
We arrived a couple days ago in Kabul and it hasn’t let us down. Its a thriving, bustling, war torn city that assaults your senses every second until you crash exhausted into bed. 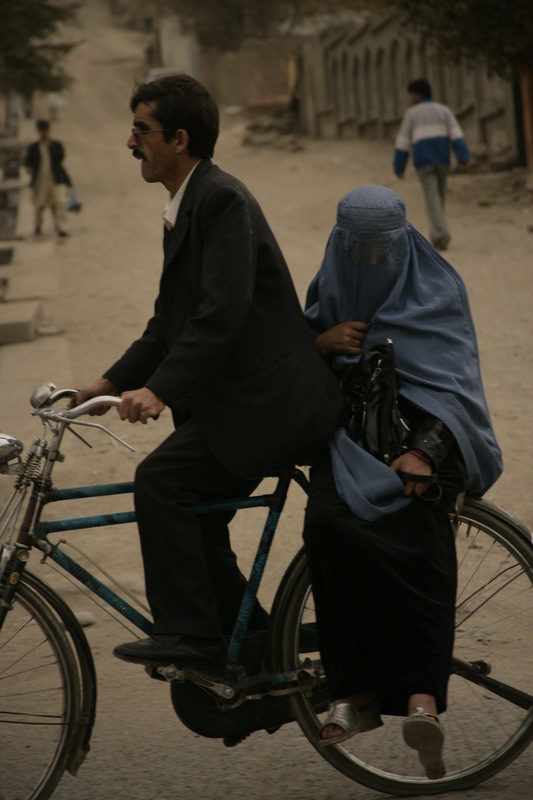 It has all the images you would expect, bluebird colored burqa clad women, beggars, bullet riddled buildings, and busy streets filled with cars, bicycles, people, police, and the occasional tank or two. Our driver, Shah Mohammed, tenses and speeds up whenever we pass one – because THOSE are the targets and you don’t want to be near one if it blows up. Its a heady lesson for tailgaters. Our driver is an ex military commander, ironically he was in the transportation department, and I feel completely comfortable in his capable hands as he steers between buses, around donkey carts and pedestrians, in the complete and utter chaos of the Kabul streets. Its a complete free for all in all directions with bodies crossing in between cars and buses like a speed game of chicken. Drivers don’t yield for anyone. Human, donkey, bicycle, tank, or bus – the littlest car will confidently pull out into oncoming traffic, the wrong way, and calmly beep his horn and somehow melt into the six lanes of miscellaneous traffic. What I didn’t expect was the complete and total destruction of the infrastructure of a city. One hundred times worse than what I saw in Beirut. Buildings completely gutted out and crumbling with people and businesses still occupying them in some fashion. Only one road we’ve been us thus far, the newly fixed one from the airport is ‘driveable’, a few main thoroughfares are rutted and bumpy, but every side street requires serious off road driving skills. Everything is done on the streets. Need to change money? There’s a guy at the roundabout that we stop at to change $200 dollars into local currency. Need to buy a phone card for the cellphone? There’s a ‘shop’ on the side of a busy intersection with a cart full of whichever phone card needed. The markets are streetside and carts pulling apples, bananas, construction materials, and pretty much anything else you could need, set up each morning inches from the traffic. Our translator and driver offer great advice and direction, and err on the side of security to the point I get a little claustrophobic. You can’t just go walk out for a cup of tea or get a bottle of water. There are security guards and barriers at each end of our alleyway, as well as a night guard. While the meetings we are taking and the activities we are doing far exceed my initial wish list…there are a few items that will probably get scratched off. The bird market is out – for security reasons. Too crowded and too visible to be safe. Local music at a restaurant or teahouse at night is also out, we are back at the guesthouse before dark each night and have our dinner here. Yet, unexpectedly, I feel quite comfortable here. I wake each morning to the local Iman’s call to prayer, and find myself with a content smile on my face. I’m not looking at buying real estate, but despite the chaos, stress, and security threats…I’m where I want to be.